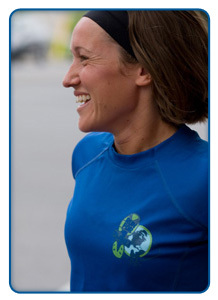 Driven by a commitment to create positive change in the world, in 2006 Steph co-founded the charity Run for One Planet. R41P is a charitable organization focused on inspiring environmental action, one step at a time. Dreaming big, she co-founded R41P by running 11,000 miles (420 marathons) around North America in one year while managing a diverse, international team of 30 volunteers, and speaking to over 30,000 kids at 220 school presentations. To honour the organization, Mayor Gregor Robertson officially declared May 8th as ‘Run for One Planet Day’ in the City of Vancouver. R41P is now partnered with the Vancouver Foundation, Canada’s largest charitable foundation, to sustain its Legacy initiatives in perpetuity. Steph’s leadership of this unprecedented expedition has allowed her the opportunity to speak to organizations such as lululemon and Whole Foods Market, as well as hundreds of local groups striving for excellence, such as Olympic Athletes and National Student Leadership Conferences.